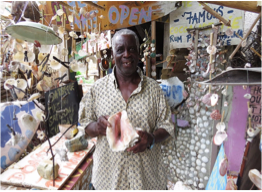 Unlike many of the Caribbean islands, the BVI have managed to preserve their natural surroundings from the over-development threat often caused by a thriving tourism industry. 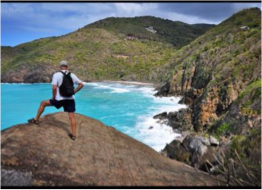 Great efforts put into the protection of the land has made of the BVI an ideal getaway destination for those seeking sheer relaxation and appreciation of the country’s raw beauty. The best way to enjoy all the things the country has to offer is to travel around its many islands and cays, and explore the various National Parks, stunning coastal spots, as well as its many historic sites in the shape of mines and plantation ruins, commemorative parks, ship wrecks, and artefacts, immortalising the culture and heritage of this richly diverse nation. Hike the country’s highest peak, wander around the old plantation estates, explore the colourful marine life that surrounds each island, and when you feel the need to indulge, treat yourself to a rejuvenating spa treatment, a mouth-watering meal at one of the locals’ favourite food joint, or a shopping spree around the many craft and souvenirs boutiques. Mount Healthy Park was established in 1983 and stretches over 1 acre of land that is home to the intact remains of an 18th sugar plantation windmill, the only of its kind on Tortola. The windmill was part of the island's wealthiest planter's 250 acres-large estate, of which additional ruins are left around the land, such as the remnants of the distillery, the boiling house, the animal mill round, storage shed, hospital, as well as housing quarters. Home to the island's highest point, the 1,370 feet-high Gorda, this 260 acres-large park is located on the north-western ridge that is north of Soldier Bay and south of North Sound. Being one of the region's last examples of Caribbean dry forest, the site is home to a few endangered plant species, including the Calptranthese thomasiana and Zanthoxylum thomasiana, which both appear on the US Federal Endangered Species list. Crystalline waters and picturesque boulders compose the beauty of this lovely 5.5 acres National Park, which provides great swimming and snorkelling conditions, as well as being a family-friendly spot with its picnic tables, recreational ground, and natural pool known as the Crawl. Declared a national park in 1988, this 243 acres island can be found on the North Sound of Virgin Gorda, and takes its name from the cacti-filled hills that slope down to stunning beaches. To find the island's best beaches, head to the northern and eastern coastline, where you'll find some great swimming and snorkelling spots, such as North Beach. Hikers will also enjoy the trail taking them up a gentle slope from the Sand Box Bar to finish down on North Beach. This 48 acres island boasts a beautiful landscape composed of abundant coastal vegetation and impressive boulders much like the ones found in The Baths. The island is home to several endangered bird species, such as the red-billed tropic bird, and was declared a bird sanctuary in 1993, for being a major nesting site to the likes of the laughing gulls, brown boobies, brown pelicans, noddies, as well as sandwich, royal and bridled terns. Spreading over 86 acres and established in 1964, Sage Mountain is the country's very first National Park, and represent the beginning or land and wildlife preservation in the BVI. This 7 acres-large park is composed of a collection of smooth, granite boulders forming maze-like caves, tunnels, sheltered grottos and warm pools that flow into the sea at high tide. To get here, you’ll have to hop on a ferry or ride the taxi boat, but it’s a great snorkelling spot and popular for yachts to anchor. Located off Long Bay, this 1.25 acres cay is a bird sanctuary that was declared a national park in 1991, and is part of a proposed protected area that includes Sandy Pit, Sandy Cay, a share of Little Jost Van Dyke, as well as their surrounding marine areas. You will find one of the BVI's latest national parks located on the eastern shore of Grand Camanoe. This 19.6 acres Cay features a lagoon system and extensive shallow reef providing calm waters as well as abundant marine life offering great snorkelling opportunities, with a chance to spot Bar Jack Fish, Yellowtail Snapper, Sharpnose Puffer, Spotted Goatfish, Schoolmaster, as well as Green Turtles. The Tobago Cays are situated at the north-western end of the BVI chain, surrounded by rugged cliffs and featuring sea-beds dropping to depth of 165 feet, providing exciting diving sites. Experienced divers will enjoy the Mercurious Rock, on the east side of Great Tobago, whilst the south of the island features a system composed of sand channels, shallow reefs and bank pavement. 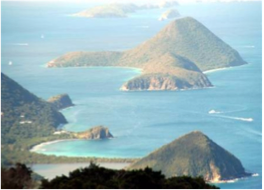 The first and only Marine National Park of the BVI was established in 1980 and stretches over 800 acres, from Lee Bay on Salt Island to Dead Chest Island. It is home to the Rhone wreck, a 310 feet long and 40 feet wide Royal Mail Steamer that sunk in 1867 with 125 people on board, and now lies in two parts ranging from a depth of 30 to 90 feet. Extending over 18.4 acres from the ridge of Anderson Point to the bay sitting at the Mount Healthy's base, Shark Bay is a rocky beach shaped by the north Atlantic swells softened by the offshore coral reef and limestone pavement. 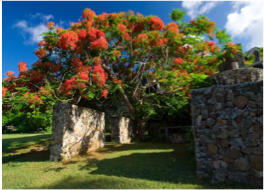 Located south of the Yacht Harbour, this 36 acres park is a wildlife sanctuary that was once home to a Spanish fortress, the remains of which can still be found on the hillside, including the Powder House ruins. The site is hidden by massive boulders and is not easily accessible and the undeveloped nature of this area requires hikers to cross thick vegetation and rugged terrain. Located on the island's south-western end, this 58 acres large park can be accessed by boat or through a 15 minutes' walk from the car park at the top of The Baths. A second trail leaving from the eastern end leads to The Baths through a series a massive granite boulders, with the added touch of adventure of having to crawl, wade through water, and climb ladders. You will find this major landmark dominating the Min Hill on the south-eastern cliffs of the island. The ruins here are surrounded by a great display of granite rocks with deposits of tin copper, quartz, feldspars, as well as other clay minerals, in this beautiful 18.36 acres-large park. This park is located at the west of Virgin Gorda, right at the heart of a cluster of volcanic islands called The Dogs, and is surrounded by Great Dog, George Dog, East and West Seal Dogs and Cockroach Island. The rugged cliffs create the perfect habitat for nesting seabirds including Sooty terns, bridled terns, red-billed tropicbirds, as well as the endangered Roseate Tern. This uninhabited island features three dive sites that can be reached by dinghy from Deadman's Bay, including the beginner and snorkeler-friendly Coral Gardens, with its calm waters and abundant and varied display of coral life. Requiring more experience, the Dead Chest West is a site featuring caves, mazes, bowls, and archways. 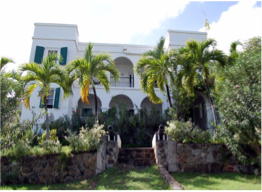 Built by the McCleverty slaves, the Lower Estate Sugar Works produced sugar until the 1940s, and is believed to have been the country's very first Guest House in the 19th century. The Government then acquired the site in the 1900s, adding a one storey building opposite the Magazine, as well as Cotton Factory machines, leaving the Agriculture Department to manage the site. This prison is Road Town's oldest building and has been the scene to historic events such as the execution of Arthur W. Hodge, a plantation owner, on 8th May 1811, for having murdered of a slave. 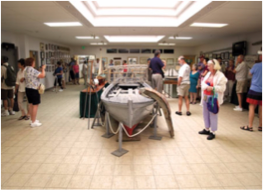 Located in Carrot Bay, this cluttered museum gathers a rich collection of shells, as well as boats and crafts. This 1840 edifice is believed to be the first church in all the Americas that was built for liberated Africans. With the goal of preserving the local maritime heritage, the JVD Preservation Society took the ambitious project to recreate a fully functioning replica of a traditional Tortola sloop, the Endeavour. 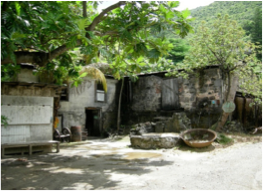 A rustic site featuring the original structure of a Sugar Cane distillery, where rum is produced using the original boiler before being stored in the original storage casks. The site's old guard house has also been preserved and now houses an art gallery and gift shop, where visitors can purchase a samples of rum. Originally a sugar factory, this site was repurposed in the early 20th century into a rum distillery, featuring diesel and steam-powered machinery that is still visible on the site today. The historic building is now home to an art gallery, shop and restaurant. Built in 1880 and rebuilt in 1926, the Government House was closed to the public as a residence in 1996 and has now reopened as a museum - an ongoing project that gathers furniture, artefacts and seeks funds to preserve the story of the Governors House. The symbol of the population's mobilisation, led by pioneer Noel Lloyd, against the Bates Hill Agreement, under which locals would have not been allowed to access the area, except for those working there as a servant. The people's struggle and determination led to the FCO agreeing to buy back leases of Wickham's Cay in 1970, and is immortalised in this park by a statue of Noel Lloyd and a commemorative plaque. Located on North Sound, this museum displays a collection of artefacts gathered from the wreck of The Rhone and other shipwrecks, by the museum owner and renowned diver Bert Kilbride. Located in Road Harbour, which it was built to defend, this fort rises at about 20 feet above sea level, offering stunning vistas of the surrounding islands. Rebuilt by the British in 1776, the site still presents some original features such as the cannons and magazine, and was named after the Governor of the Leeward Islands, William Burt. Nowadays, the site is home to a hotel and restaurant, offering the opportunity to enjoy a meal in a historic site. Road Town's main shopping district is also home to several historic landmarks such as the mid 1800s Post Office, the Britannic Hall, St George's Anglican Church, and the Virgin Islands' Folk Museum. This site was home to much of the commercial and trading exchanges in the 1940s and 1960s, and is named after the country's first citizen to be knighted, a community leader, public servant and member of the legislative and Executive Councils of Virgin Islands. Local entrepreneurs started using sailing vessels as early as the 18th century to conduct their trades throughout the Caribbean, a tradition that gave birth to the Tortola Boat, around which the BVI economy and culture developed, and the design of which is unique to the country. Kiteboarding is fun way to get a new perspective of the island, by exploring it from the coast, and up in the air! For one of the island's favourite spots, head to Virgin Gorda, North Sound, where the Eustatia Reef safeguards visitors from rough conditions.If it's the waves you're after, you'll find the island's surfer's favourite in Tortola's Cane Garden Bay, where the ride is made even better by some of the world's largest reefs and most colourful tropical fish. Another great way to discover the country's natural beauty is to kayak around its beautiful coastline and explore its shallows. There, you will be able to spot and observe a wide variety of marine wildlife, including the playful dolphins at the Tortola Dolphin Discovery! 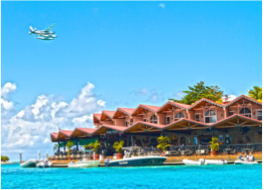 With so many different islands and cays waiting to amaze you, great year-round weather, consistent trade winds, and beautiful clear water, it's no wonder the British Virgin Islands are so popular with sailors and captains! A true sailor's paradise, whether experienced or novice, offering a new heavenly spot every day, whether it's a secluded bay, a popular beach bar, or the perfect snorkelling spot. Savannah Bay is a pristine snorkelling cove near The Valley. A wonderful and exciting underwater National Park that is home to thousands reef fish and coral with its wonderful array of colour. There isn’t anywhere to rent equipment here however, so you will need to bring your own. And to add a touch of excitement to your kayak exploration, you will find operators offering clear bottom kayak tours, including night ones where the kayaks are equipped with LED lighting!